A poetic and powerful memoir about what it means to be a Black woman in America—and the co-founding of a movement that demands justice for all in the land of the free. Raised by a single mother in an impoverished neighborhood in Los Angeles, Patrisse Khan-Cullors experienced firsthand the prejudice and persecution Black Americans endure at the hands of law enforcement. For A poetic and powerful memoir about what it means to be a Black woman in America—and the co-founding of a movement that demands justice for all in the land of the free. Raised by a single mother in an impoverished neighborhood in Los Angeles, Patrisse Khan-Cullors experienced firsthand the prejudice and persecution Black Americans endure at the hands of law enforcement. For Patrisse, the most vulnerable people in the country are Black people. Deliberately and ruthlessly targeted by a criminal justice system serving a white privilege agenda, Black people are subjected to unjustifiable racial profiling and police brutality. In 2013, when Trayvon Martin’s killer went free, Patrisse’s outrage led her to co-found Black Lives Matter with Alicia Garza and Opal Tometi. Condemned as terrorists and as a threat to America, these loving women founded a hashtag that birthed the movement to demand accountability from the authorities who continually turn a blind eye to the injustices inflicted upon people of Black and Brown skin. Championing human rights in the face of violent racism, Patrisse is a survivor. She transformed her personal pain into political power, giving voice to a people suffering in equality and a movement fueled by her strength and love to tell the country—and the world—that Black Lives Matter. 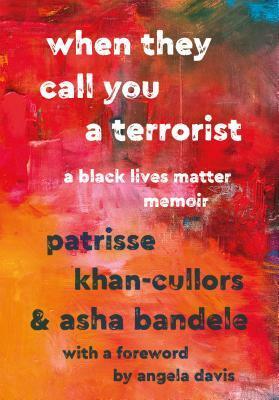 When They Call You a Terrorist is Patrisse Khan-Cullors and asha bandele’s reflection on humanity. It is an empowering account of survival, strength and resilience and a call to action to change the culture that declares innocent Black life expendable.